Targets in the middle is an excellent drill for players to work on moving the ball, keeping possession, and finding open teammates. 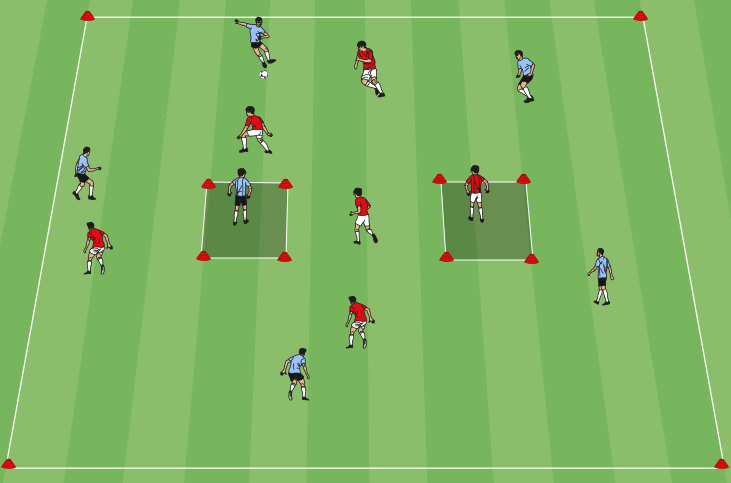 To play targets in the middle, set up a grid with two target zones in the middle of the field. Divide players into even teams. This drill works well when there are between five and eight players on each team. Both teams assign a player to occupy one of the target zones in the middle. The two teams play keep away from each other, trying to complete six passes in a row. Once a team completes six passes, they can play a pass to their target player for a point. The game continues after a point is scored as the target player plays a pass back out to their teammates who try to maintain possession. The first team to earn three points wins. Emphasize movement from players when their team has the ball so that they work on finding open space and passing lanes. Players should look to play to their target player when a good opportunity arises and avoid trying to force it if the middle is well defended. Can a player outside the “zones” play a ball to player in the “zone” to simply keep possession and not for a point? Also, can a player outside the “zone” on say the blue team play a red team player in the “zone” for a point / to keep possession? Hi Garrett! In response to your first question, it is the coaches preference. I usually like to allow players to pass to the player in the middle to keep possession. This is especially helpful for high school players because the extra passing option makes it easier for them to keep the ball. In regards to your second question, the blue team plays to the blue target player and red team plays to red. However, I would imagine that you could play another variation of this game with neutral target players in the middle.